The bar-winged flycatcher-shrike (Hemipus picatus) belongs to the family of woodshrikes and flycatcher-shrikes, Tephrodornithidae. The bar-winged flycatcher-shrike species is distributed in Indian subcontinent, southeast Asia and China. This flycatcher-shrike species has black and white plumage. These flycatcher-shrikes are polytypic species. The bar-winged flycatcher-shrike (Hemipus picatus) is a small bird, measuring 14 to 15 cm in length and weighing 8 to 10 grams. They have black and white plumage. The adult male of the nominate subspecies of bar-winged flycatcher-shrike has a glossy black cap extending from the forehead to nape. The lores, ear coverts, upperparts and wings are also black. The cheeks and the sides of the neck are white. There is a white slash like patch on the wing. The center of uppertail is black and the outer tail feathers are white. The underparts are whitish. Some flycatcher-shrikes have pale pink or maroon wash on the underside. The bar-winged flycatcher-shrike bill is black and the upper mandible is hooked at the tip. The nostrils are covered by rictal bristles. The irises are black. The eye-ring is gray. The legs are black. The bar-winged flycatcher-shrike call is a rapid and sharp "tsit-it-it-it" or a "whriri..whirriri..whirriri" sound. The bar-winged flycatcher-shrike species are distributed in India, Bhutan, Bangladesh, Nepal, Sri Lanka, China, Myanmar, Thailand, Cambodia, Laos, Vietnam, Malaysia and Indonesia. In India, these bar-winged flycatcher-shrikes are distributed in the states of Himachal Pradesh, Uttarakhand, Uttar Pradesh, Bihar, West Bengal, Odisha, Jharkhand, Chhattisgarh, Madhya Pradesh, Gujarat, Maharashtra, Telangana, Andhra Pradesh, Karnataka, Tamil Nadu, Kerala, Assam, Meghalaya, Arunachal Pradesh, Nagaland, Manipur, Tripura and Mizoram. The bar-winged flycatcher-shrike nominate subspecies H. p. picatus is distributed in west, central and east India, Bangladesh, west and south Myanmar, central Thailand, Cambodia and south Vietnam. 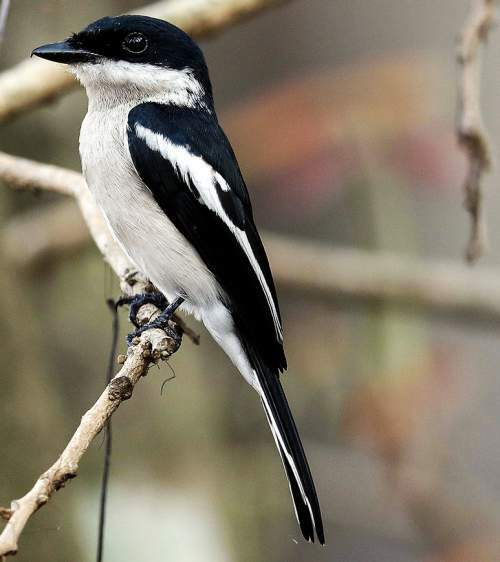 The bar-winged flycatcher-shrike subspecies H. p. intermedius is distributed in southern Thailand, Malaysia and Indonesia. The flycatcher-shrike subspecies H. p. leggei occurs in Sri Lanka. 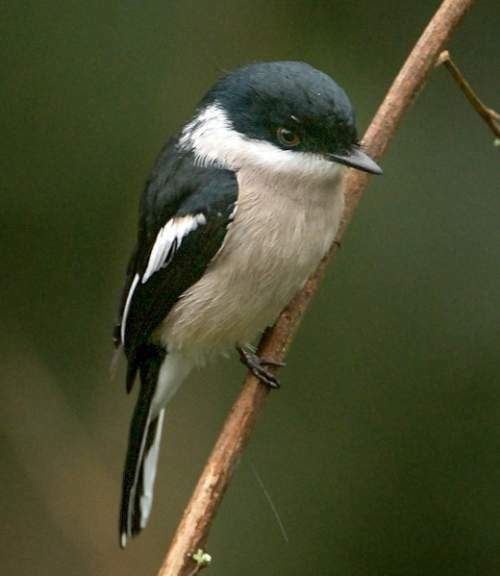 The bar-winged flycatcher-shrike subspecies H. p. capitalis is distributed in the Himalayan states of India, Nepal, Bhutan, northeast India, southern China, north and central Myanmar, north Thailand, north Laos and north Vietnam. These bar-winged flycatcher-shrike species have moderate forest dependence. They normally occur in altitudes from 0 to 2000 meters. The artificial ecosystems and habitats of these species include rural gardens and plantations. 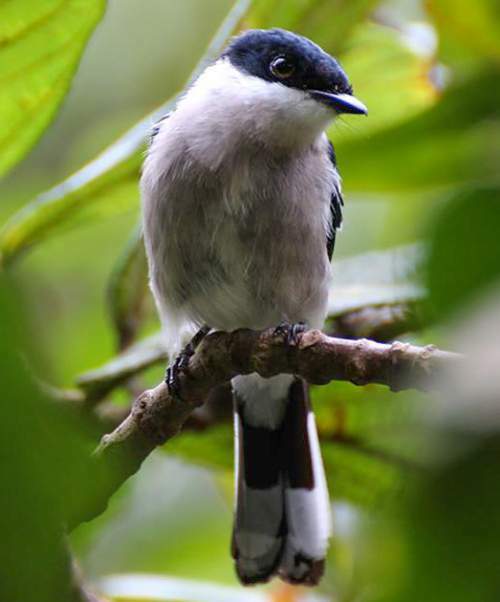 The natural ecosystems and habitats of these flycatcher-shrike species include tropical and subtropical moist montane forests, evergreen forests, moist shrublands, broad-leaved forests, secondary forests and tropical and subtropical moist lowland forests. The diet of bar-winged flycatcher-shrike consists mainly of insects. Insects, insect larvae, ants, termites, beetles, spiders, cicadas, moths, butterflies and crickets are their primary food. These bar-winged flycatcher-shrike species hunt insect prey in the mid-canopy of forests. They form feeding flocks with other small birds like babblers and white-eyes. The flycatcher-shrike hawk airborne insects and also glean their prey from the foliage and branches of trees. The breeding season of the bar-winged flycatcher-shrike species is from February to August in Indian subcontinent. In Myanmar, the breeding season is mainly during April. In China, the laying season is from March to July. These birds are monogamous. The nest of the bar-winged flycatcher-shrike is a cup-like structure, made of twigs and bound by cobwebs. The nest is lined by fine grass and plant fiber. Both parents take part in building the nest on tree branches. The bar-winged flycatcher-shrike clutch is two or three oval pale buff or pink eggs with dark brown blotches. The breeding pair take turns to incubate the eggs. The parents brood the chicks and keep feeding them till they fledge. These bar-winged flycatcher-shrike species are non-migratory, resident birds. The birds in higher altitudes move to lower levels and plains during winter. Post breeding, the juvenile bar-winged flycatcher-shrikes may disperse and establish in new locations within the range. They may make local movements for feeding and breeding within their range. The global population size of the bar-winged flycatcher-shrike (Hemipus picatus) has not been quantified. The overall population trend of these species is considered to be stable. Throughout its range, this flycatcher-shrike species is reported to be common. The generation length is unknown. Its distribution size is about 14,200,000 sq.km. Habitat alteration and destruction, deforestation and trapping for pet-trade are the main threats that may endanger the survival of these flycatcher-shrike species. The bar-winged flycatcher-shrike (Hemipus picatus) does not approach the thresholds for being Vulnerable either under the range size criterion, or under the population trend criterion or under the population size criterion. The IUCN (International Union for Conservation of Nature) has categorized and evaluated the flycatcher-shrike species and has listed it as of "Least Concern". The CITES (Convention on International Trade in Endangered Species of Wild Fauna and Flora) status is ‘Not Evaluated’ for bar-winged flycatcher-shrike (Hemipus picatus). The four recognized subspecies of the bar-winged flycatcher-shrike (Hemipus picatus) are: Hemipus picatus picatus (Sykes, 1832), Hemipus picatus capitalis (Horsfield, 1840), Hemipus picatus leggei Whistler, 1939 and Hemipus picatus intermedius Salvadori, 1879. Current topic in Birds of India: Bar-winged flycatcher-shrike - Hemipus picatus.